This PDF 1.5 document has been generated by Microsoft® Word 2010 Trial, and has been sent on pdf-archive.com on 13/06/2014 at 11:56, from IP address 121.54.x.x. The current document download page has been viewed 654 times. weight-bearing area of our body. (along long axis of bone). end of the bone, or the metaphysis. keep the fracture in place as it heals. by growth arrest and subsequent deformity. for normal growth to continue. formed at the site of the fracture. It is most likely to occur at the knee or ankle. Crushing injury of the growth plate. involved, leading to growth stunting. the growth plate, and into the metaphysis. 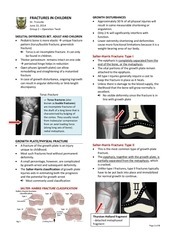 normal and to perfectly align the growth plate. reduction; unstable in flexion &amp; extension. portion of the arm, deformity also present. untreated or not managed properly. displaced fracture of the shaft of radius and ulna. The opposite of Galeazzi fracture. pressure and results in muscle and nerve ischemia. in Children by Rockwood and Wilkin 6th Ed. This file has been shared by a user of PDF Archive. Document ID: 00168850.